As much as you'd absolutely love to hear your wee hammie's thoughts in words, that's just not how the little rodents communicate. However, hamsters definitely are adept at expressing their feelings when necessary. He chatters his teeth, for example, as a way to convey annoyance, among other things. 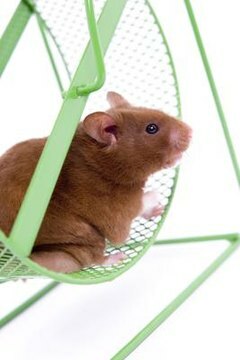 If your hamster's teeth are chattering, it could be a sign the little guy is feeling pretty annoyed about something. Someone or something is causing your hamster to not feel in his element. If you approach your hamster to pet him and he starts up with the chattering, for instance, it's probably not the greatest time to get tactile with the furry cutie. He very likely doesn't want to be around anyone, so allow him that freedom for a while. Just like human beings, hamsters aren't immune to occasional bouts of irritation, after all. The chattering of a hamster's teeth may also signify apprehension, especially in situations of conflict between two males. The sound even may be an alert that physical aggression is on the horizon, so be extremely careful if you hear any chattering sounds. It just may be your cue to separate the little fluffballs from each other, otherwise it could get dangerous for one or both of them. If a hamster perceives that another is invading his own individual space, his teeth may begin chattering out of anxiety and worry. Hamsters, especially of the Syrian variety, can be very territorial creatures. Sharing is certainly not their strongest suit, and may lead to a serious case of nerves. Teeth chattering also can mean something as simple as hunger. If your pet makes these unusual teeth sounds, check out his food situation. The chattering may be a sign that the poor thing is looking for some sustenance to put into his mouth. When a hamster's teeth chattering seems unusual or excessive, it can even be a symptom of a medical ailment, especially if the hamster is also experiencing weight loss or reduced appetite. If you notice any or all of these symptoms, it's time to get your hamster to the veterinarian -- stat.